The CMF store offers products for sale to assist professionals in dealing with matters related to spiritual and religious diversity. Order Form. A PayPal button is posted below, if you like to order online. 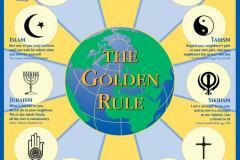 In July 2000, Scarboro Missions published the Golden Rule Poster featuring the Golden Rule in 13 religions in a striking and attractive 4-colour format. Scarboro Missions has been stunned by the success of the poster - this piece of multifaith art is making its way around the world. Everywhere it goes, it performs its magical task of healing, unity and reconciliation. PRAYER MAT, REGULAR (MUSLIM/ISLAMIC) Order Form. SUPPLIES, RELIGIOUS BOOKS & GIFTS FOR ANY FAITH GROUP Order Form. Alors que le Canada se dirige vers une société de plus en plus diversifiée, il est impératif que les personnes responsables des soins, de l’éducation et de la protection de nos citoyens soient mises au courant des conséquences pratiques des diverses croyances religieuses. Le Manuel d'Information Multiconfessionnelle fournit des renseignements concis démystifiant une partie du mystère de la gestion de la diversité religieuse. Voici la cinquième édition du guide de référence pour les soignants spirituels et religieux et les personnes-ressources. Order Form. A PayPal button is posted below, if you like to order online. CONTAINS: nearly 30 b/w illus. As Canada moves towards a more diverse society it is imperative that individuals charged to care, educate and protect our citizens be made aware of the practical implications of diverse religious beliefs. The Multifaith Information Manual provides concise information which takes some of the mystery out of management of religious diversity. This manual reflects the broad spectrum of discipline and practice which is the celebration of spirituality in our diverse communities. It has been enlarged, expanded and re-written in response to readers’ feedback to make it more convenient and useful. Order Form. A PayPal button is posted below, if you like to order online.